Websites vs. Apps: Which is the Best Option? The digital world today adds immense value to our everyday lives by helping everyone succeed and prosper in an instantaneous world. We have all heard the expression, “our future is digital”. However, making the right digital decisions when it comes to business may be tricky. New business owners will debate on whether or not they should invest in creating websites or apps. Of course it really depends on the type of business however, read this article to get a deeper dive into which is more beneficial for you and your business. 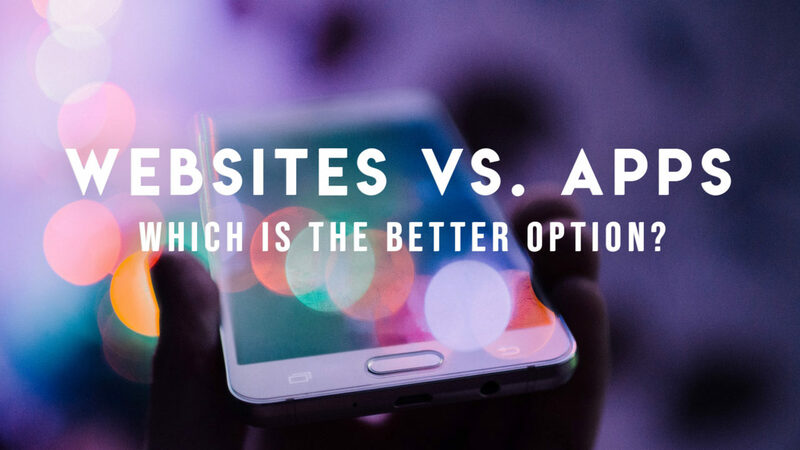 Before making the ultimate decision as to which mobile strategy is best for you and your business, it is important to understand the difference between a website and an app. Apps are downloadable applications that live on a mobile device. In order to download an app, a user must search for them through portals such as Apple’s App Store and Android Market. A website is a collection of HTML web pages that are linked together, such as the one you are on right now! As previously mentioned, the decision to develop an app, a website, or both, ultimately depends on your end goal. Ideally, it would make most sense to develop an app if your end goal is to create an interactive game or serve another very specific service. If your end goal is primarily related to marketing or to reach a large audience, a website is your best option. In some cases, you may think that having both may be the best decision. However, rarely will it be necessary to develop an app without having a website established first. According to Pinch Media, there are over 20,000 apps which have been downloaded more than 500 million times. Sounds convincing to start an app, doesn’t it? However, there’s a catch. For free apps, about 20% of users return to the app after the first day of downloading it. After that, it quickly declines. After the first 30 days of downloading the app, only 5% are returning. For paid apps, the fall off rate is a little steeper. So what does this mean for you if you are debating on creating a website or an app? In short, you have a very small window to make an impression and potentially make a revenue. Since it has become necessary for businesses to develop digital strategies, responsive web design has become a new standard for designing websites. This does not only mean that a website is mobile-friendly, but also that it can scale to any size device. This includes smartphones, tablets, or desktops. If you have a responsive web design, users have access to your valuable information instantaneously. It might create a barrier if users are initially required to download your information through an app. Additionally, if you are utilizing a responsive web design, you will be able to easily update information right on the back-end of your site. A user must update their app in order for new content to be available. Lastly, websites are easily shareable between users, which make it easier for content to reach a large audience. Users cannot share apps amongst each other. Despite apps and websites both having their own pros and cons, a responsive web design is all you will need. Yes, it is undeniable that being able to send push notifications to your customer through an app is an awesome way to grab their attention. However, many consumers either turn off notifications or will be hesitant to even download an app because of limited storage. After all, websites and apps have many of the same functions such as social sharing, ecommerce, images, video, and more. Most customers will search for information through a browser rather than an app. A responsive website is all you need for a consumer to be able to connect with your business at any time without any additional marketing touch points. At ADventure Marketing Agency, we specialize in creating websites as well as implementing creative and realistic SEO strategies. If you are looking for help in either, contact us today for a free consultation.